We have our first long weekend of the year here in the USA with the observation of Martin Luther King Jr. Day on Monday. It appears that a big winter blizzard, code named Harper, could be shutting down the northeast this weekend too. On the bright side, together they make for quality tangling time. Also reading, snoozing … Be safe and stay warm! 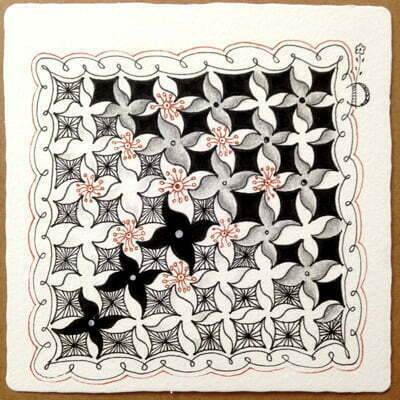 Taiwan CZT Damy (Mei Hua) Teng shares her 30th tangle on the site with us today! Q-Mi is a Cadent-inspired tangle that produces a pretty, floral motif in a very simple way. Damy writes that Q-Mi is named for her cat. I left my example of Q-Mi quite basic but in this tile Damy shows a host of ways to embellish Q-Mi. Usually the number of elemental strokes needed are 3 or less. Often, you only need one or two. By ‘elemental strokes’ we mean a dot, a straight(-ish) line, a curve (like a parenthesis), a reverse curve (like an ‘S’), and an orb or circle. 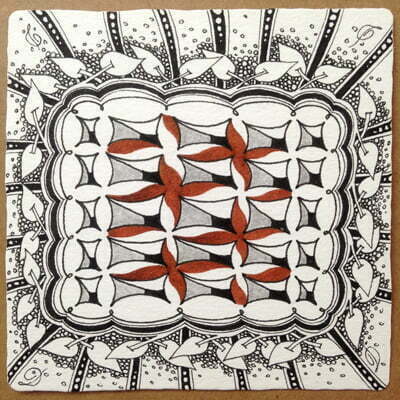 Here’s another lovely tile from Damy with more ways to embellish Q-Mi. For Step 1 in tangling Q-Mi, I found it helped in aligning everything to create all the matching pairs of C-curve strokes, like parentheses, first: ) ( ) ( — then turn my tile and “close up” the shapes. The final S strokes create the floral element. Easier than the embellishment decision-making! Damy illustrates the step-by-step instructions for drawing Q-Mi below. Thank you so much for another beautiful Damy tangle! and I`d read her the ends of the lines occurring before hers. This is a wonderful tangle! It is always so much fun when a tangle “morphs” into a different shape, or you can see two shapes on the edges of each other. Going to have MUCH FUN playing! Thank you, Damy! Love it!It came together so easily, and looks so pretty. These will be seen as poinsettia next Christmas season?